Rose Maniscalco (nee Peck), 83, died peacefully at Silver Lake Nursing Home on April 8, 2017, surrounded by her loving family. Rose was born on September 26, 1933 in the Bronx. She moved to Staten Island, in 1963 and was married to her late husband, Raymond Maniscalco who passed away in 1992. She worked for Bayley Seaton Hospital as a Nursing Assistant. Rose enjoyed Bingo, Cooking and especially spending time with her grandchildren. 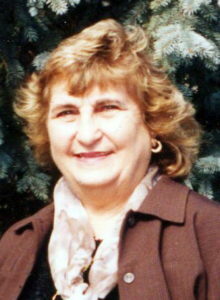 She is survived by her loving children, Jennifer (James) Pecorale, Louis & Helena Maniscalco and Christopher Maniscalco. Beloved sister of John Peck and loving grandmother of James Dean, Stephen, Sophia Rose and Raymond. A funeral service will be held on Thursday at 10:15am followed by a burial at Moravian Cemetery. Friends are invited to call on Wednesday from 2 to 4pm and 7 to 9pm at Cherubini McInerney Funeral Home, 1289 Forest Avenue, Staten Island, NY 10302.